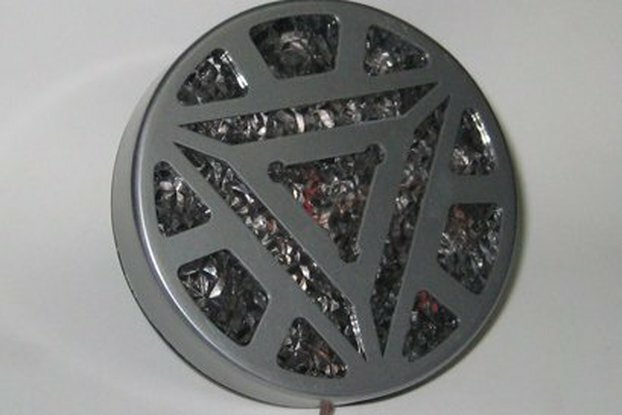 Select the kit option only if you feel save to hand solder 0805 SMD parts. 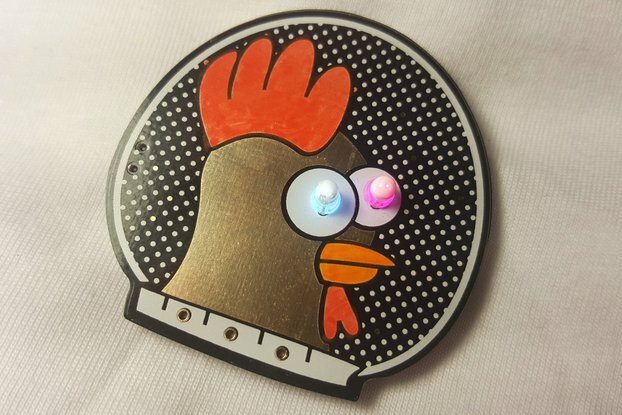 Just a badge/brooch made out of a PCB with LEDs with your favourite eighties TV show car - K.I.T.T. 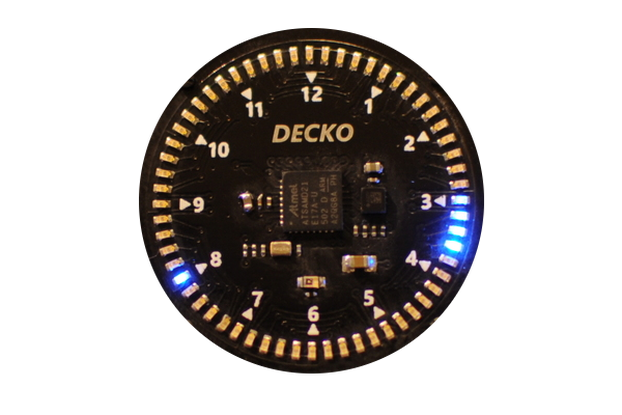 - it features an Attiny13 that controls the 8 LEDs with 4 pins. There's a special OSHpark purple (UV) LED version available for a short time, all assembled. It started as a design challenge for myself, I saw a lot of nice artsy PCBs out there and wanted to make something seemingly simple and recognisable as well. After ordering purple boards at OSHpark, I also wanted to have some black cars for accuracy. When the dirtypcb.com order came back, I had 40 boards in my hand and ordered more parts to not make them go to waste. The second revision now has 0805 LEDs and a different layout to make programming easier and safe flash ram. That allowed me to add 8 animations that you can toggle through with the push of a button. People at the MakerFaire in Zurich seemed to like it a lot! It's a small piece of nerdy nostalgia. 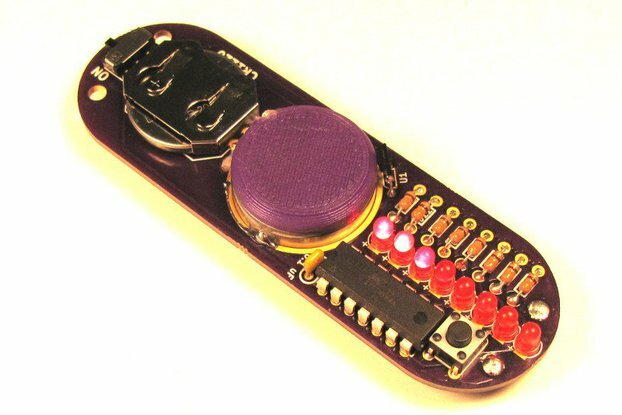 It's hackable, you can program it yourself via the ISP header/pad and also add the Attiny13 to your Arduino environment. There are two options, the standard option is fully assembled. If you want to solder up one and save me some time and you some money, there's also an 0803 kit version. Size is approximately 5cm x 3cm (2inch x 1.2inch). Batteries not included. This will not be sent with batteries, just buy 2032 batteries or use rechargeables, both voltages (3V and 3.6V) are fine. Great little product, very atttion grabbing! However, the fastening clip is weak as it came apart and I lost one of them. I need to modify my remaining unit somehow, to secure it better. thank you for your review! Actually heard that the first time, I usually squeeze the metal that holds the pin with a nose plier so it won't come off easily, but might have overlooked that one. If you'd like I can send you another badge as compensation / reclamation. Just write me a message to let me know. What a fun batch to make, and it looks FANTASTIC... but I didn't expect to see persistence of vision come out of the LEDs in a few of the visual modes - WOW, mind blown! This is really a great badge to make yourself or to give as a gift! I bought 4 of these and use them as to give out to say thank you for special events and people who help our club. A very unique and well received gift that has help ensure continued support of our club. Oh and I got one for myself obviously! If you know Knight Rider, you now KITT and its iconic front lights. This little badge gives you exactly that! It has a button to switch through different animation modes and an on/off switch.